There's one thing you should know about Knickernappies, we LOVE our retailers and strive to support them in any way we can. 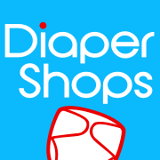 One such awesome retailer, whom we love, is DiaperShops.com also known as Kelly's Closet! Diaper Shops is a one-stop shop with everything from Knickernappies (of course) to gifts, breastfeeding gear, toys and more! Definitely a popular shop among cloth diapering families. Today we tip our hats to DiaperShops and we hope you'll swing by their page on Facebook and say hello if you're not already a fan! As luck would have it, Knickernappies Super Do Inserts are also their Deal of the Day, so make sure to check that out if you're in need of the BEST overnight solution for heavy wetters!